Hi there! Today I’m sharing a review for a new contemporary M/M romance novella from Pat Henshaw. 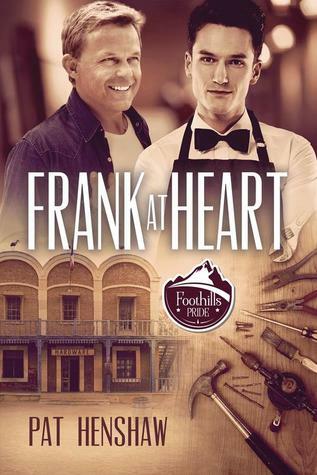 FRANK AT HEART is the sixth book in the Foothills Pride series, but all of them can be read as standalones. I really enjoyed BEHR FACTS and WHEN ADAM FELL and so I was eager to dive back into this small-town Americana world. I read down his application. I don’t use a standard form, because the ones I’d found online didn’t tell me anything I wanted to know about my applicants. My form has the usual name, address, and contact information, but it also asks about extracurricular activities, interests, and passions. A lot of kids stopped at the word “passions,” and some even asked what I meant. Henry had had no problem answering the questions. He wrote that he was a game player, both electronic and nonelectronic. He was a serious reader, listing The Silmarillion as the last book he’d truly enjoyed. Some boys can’t remember a book they’ve read, much less the last one they really got into. Also unlike most of the boys who applied, Henry hadn’t listed any sports, either as a participant or a fan. “You don’t like sports?” I tried not to ask it too gruffly, but both Darlings’ faces scrunched up. “Is that a problem?” Christopher evidently wasn’t worried about being too gruff. “No. I follow a few teams. So I try to make sure rivalries and loyalties won’t become a point of contention here in the store.” Some people have remarked that mildness could be my middle name. I’ve worked hard at keeping my cool, so I don’t usually flare up. I try to surround myself with people who don’t either. The world around me got really ugly when I was angry. I smiled back. Another tiny secret moment shared. It was broken by Henry squaring his shoulders and answering me. This time Christopher and I smiled at the same time. The boy’s ability to act like an adult tickled both of us. I admired Henry for wanting to handle this interview by himself. Sure, I could feel him relying on his dad’s presence. Christopher oozed strength and support, and his rock-solid backing assured Henry he was there whenever the teen needed him. It also said Christopher would fight to hold back unless he felt he absolutely needed to jump in. I took out my pocket watch. I thought I had another unassembled test in the back room. If Henry passed—and I thought he would with flying colors—I could get him squared away with all the official paperwork and hired to start working a few hours next weekend while I interviewed a couple of the other candidates. I don’t know why I was pushing Henry through the hoops, except that I was eager to find out more about him and work with him. I got the feeling the hours he was in the store would pass more quickly than they did now. Just as they flew by when his dad roamed the aisles. “Are you free this afternoon at two?” As I asked, Henry’s eyes lit up and he turned to his dad. I could feel their excitement as it rolled off of them and hit me in the chest. I smiled as I absorbed their shared joy. When Christopher looked at me, a weird jolt of recognition hit me, like spying a loved one in a crowded room. I felt like I had reached out and found a matching half. I dropped my eyes, feeling a sudden weight of longing. Before it could consume me, I reminded myself that I don’t believe in magic or miracles or soul mates. When I blinked, he was back to being newcomer Christopher Darling, here with his son who was applying for a job. No woo-woo, no aura, no pulsating lights. Both he and Henry were staring like I’d suddenly started yodeling Madonna songs. I gave a mental shake of my head and righted myself on the tracks of life. With the point of a pencil I plucked from the soup can, I ran down my daybook and stopped at two o’clock. Then I looked up at Henry, who hadn’t answered my question. “Yes, I’m free at two. Is there anything I need to bring with me?” The boy’s response helped shelve the odd moment. I wrote his name in my book, then explained about social security and parental permission. I took out the form for the latter and had his dad complete it. “I’ll see you at two.” I stuck my hand out, and an exuberant Henry shook it. Frank McCord is a 35 year old gay man living in his ancestral home in quiet Stone Acres. He’s running his century-old ancestral hardware store, wearing the “uniform” of white shirt, bowtie and overalls designed by, yes, his great-grandfather. Frank is so practiced at his unassuming, non-threatening, super helpful shop-keeper identity that he’s lost a sense of the man he should be. Then, he meets Christopher Darling. Christopher is also in his thirties–and so beautiful he thoroughly captivates Frank. Not that Frank believes he could ever attract a man like Christopher. Still, he’s pleasant and helpful–if just a bit jealous when he learns that Christopher is out, and has a kind and intelligent teen son, Henry. The Darlings are the kind of family that Frank hoped to build, if he wasn’t tied to his past so tightly. Thing is, Christopher is in a bind. His newly-purchased house is a money pit, and Frank determines it’s unfit to live in–also helping Christopher find a contractor to restore it. Also, he and Henry now need a place to stay–so Frank, ever genial and more than a little attracted, offers his guest room. This upsets Frank’s tenant, Emil, who fancied himself Frank’s boyfriend–despite having no physical contact in several years. While Frank, Christopher and Henry build a friendship–and perhaps more–Emil’s hatching big plans, and they aren’t good. This is a sweet and innocent romance between Frank, who is remaking himself, and Christopher who’s been wounded by a shattered marriage. Henry is a good kid, happy to see his dad find love again. Don’t expect any steamy bits, but all the feels are present. Emil’s drama is sad, and a point of serious reflection for Frank, who turns his whole life upside-down during the course of this summer. New clothes, new home and a re-imagined hardware store are in Frank’s near future–and love is on the horizon. Readers will love being in Frank’s quaint life, and watching him emerge from the cocoon of his roots. Interested? You can find FRANK AT HEART on Goodreads, Dreamspinner Press, Amazon (US and UK) Barnes & Noble, Kobo and Google Play. Catch Pat on her website, Facebook, Amazon, twitter, and check out the Foothills Pride website for more deets on the series.